Initially a subsidiary of Oriental Government Security Life Assurance Company Ltd., Oriental Insurance was established in the year 1947. Since then, the company has grown exponentially and currently has more than 1,800 offices spread across India and 31 regional offices. With an employee base of more than 14,000 employees, Oriental Insurance recorded a gross written premium of Rs.8,611 crore for FY 2015-2016. 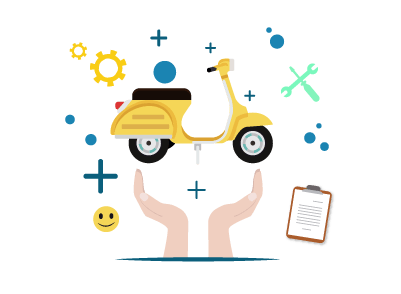 Offering a wide range of products, Oriental Insurance also offers two wheeler insurance products that come with comprehensive solutions for vehicle owners. Customers who wish to contact Oriental Insurance to enquire about their two wheeler insurance policy, or wish to register a grievance or complaint can contact the customer care team by dialing the toll-free number at 1800118485 or 011- 33208485. -#44/45, Leo Shopping Complex, 1st Floor, Residency Road. -Kheny building, No 3, 1st floor, 1st cross, Gandhinagar, P.B.No.9555. -Branch Office: 2 P.B.No:210 38/1e, 2nd Floor Mysore-570024. -The OICL Door 1 Ahmedabad, 3rd Floor, Navdeep Building, Near Income Tax Char Rasta - 380014. Malay Trade Centre Opp. Jivan Commercial Bank, Dhebar Road Rajkot - 360001. -Shree Dwaraka Deesh Complex First Floor, Queen's Road, Amritsar 143001. -Hall No.6, 27-A, Classic Plaza, Above Punjab National Bank, Majitha Road - 143001.